Total living area of the apartment is 1200m2, composed of 2 bedrooms, 2 bathrooms with modern toilet amenities, a well equipped kitchen and a nice living room combined with dining area. New serviced apartment with 2 bedrooms for rent in To Ngoc Van street, Tay Ho district, Hanoi. It is close to shops, cafes, restaurants, supermarket, etc… Easy to access other areas of Hanoi. 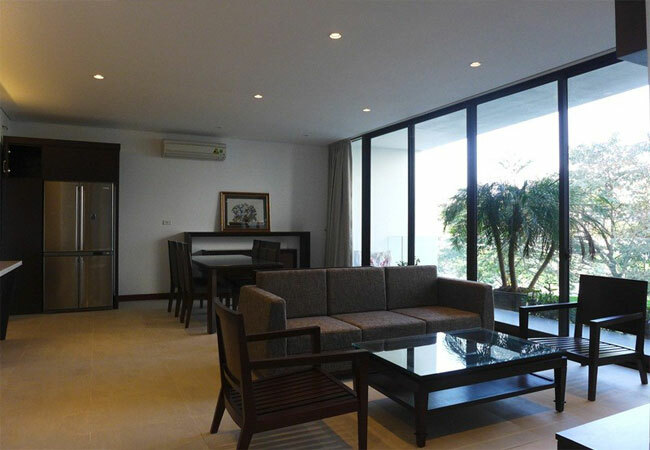 This rental apartment is located in the high floor building with great view of Westlake. It has total living of 90 sqm, composed of a bright living room, a well equipped kitchen, 2 bedrooms and 2 bathrooms, big balconies. The living room is in the front side of the building looking over the West Lake. This brandnew high quality Apartment Builing is located in quiet and safe area in Yen Phu village, Tay Ho district, Hanoi. It is easy for car access, nearby West Lake, restaurants, Seryna shooping center. Just 15 minutes from Hoan Kiem Lake, 30 minutes from Noi Bai Airport. Brand new serviced apartment with 1 bedroom for rent in Au Co street, Tay Ho district, Hanoi. It is close to shops, cafes, restaurants, supermarket, etc… Easy to access other areas of Hanoi. Total living area of the apartment is 75 sqm, composed of 1 bedroom, 2 bathrooms with modern toilet amenities, a bright living room combined with dining area and a well equipped kitchen. Beautiful apartment for rent in Nghi Tam village, Tay Ho, Hanoi. This apartment is located on the 3th floor of high quality lakeside building with elevator, staircase, gara. This serviced apartment is located in To Ngoc Van street, Tay Ho district. Total living area is 50 sqm, composed of a bright living room combined with dinning area, a cozy bedroom, a bathroom and kitchen. Brand new serviced apartment with 1 bedroom for rent at Tay Ho District, Hanoi. It is close to shops, cafes, restaurants, supermarket, etc… Easy to access other areas of Hanoi. Total living area of the apartment is 50m2, composed into 01 bedroom, 01 bathroom with modern toilet amenities, living room combined with kitchen and dining area. This rental apartment is located on the 7th floor of the building with great view of Westlake. It has total living of 190 sqm, composed of a spacious living room, a well equipped kitchen, 3 bedrooms and 3 bathrooms, 2 big balconies. The living room and the kitchen is in the front side of the buildingh looking over the West Lake.